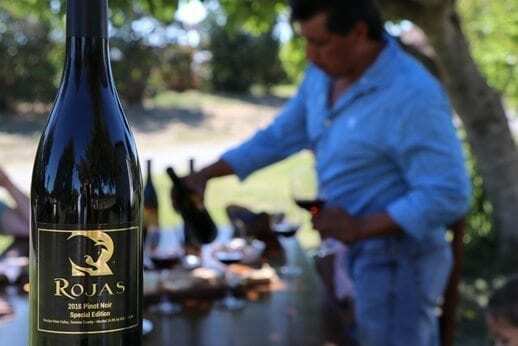 The story of the Rojas Winery began in 2009 when Jaime Rojas and his family bought a small 12-acre property in West Santa Rosa (Russian River Valley). Early on, Jaime had a vision of building a vineyard on the land one day. Now named the Bravo Toro Vineyard, the land is ideally positioned for growing grapes. Slightly inclined toward the south, the land enjoys plenty of sunshine. The soil is deep and rich, and the south-facing tilt along with its lighter gravel and sandy properties, warms and drains easily. Grapevines love it! Still, even with everything going for it, there was a lot to be done. The land needed to be worked and prepared to become a producing vineyard. For expert labor, Jaime relied on his great team from Napa Second Generation, a company with many years of experience in vineyard development and maintenance. In 2012 Jaime’s father, Antonio, planted the first vine in the new Bravo Toro Vineyard. Over the next few weeks, the rootstock plants began growing in the fertile Russian River Valley. Caressed by the morning breeze and nestled by the valley’s typical fog, the little vines thrived until finally they were ready for the first harvest in 2016. Thanks to the Russian River Valley’s ideal growing conditions for Pinot Noir, the first year yielded an ideal vintage. What were once only dreams and ideas became a unique wine and the start of the Rojas family winery. Today, the winery is managed by Jaime Rojas and his wife, Jana (see left photo). Rojas, the family name… means red in Spanish. It fits, since the color of our Pinot Noir wines is pure red. Red stands for passion, bravery and love. This is exactly what our wine represents. Bravo Toro, the name of our vineyard… means brave bull in Spanish. You can see a brave bull inside the Rojas Winery logo. Rodeos with brave bulls are still a part of Mexican culture. Excitement and emotions flow abundantly at each rodeo show. We are proud of our Mexican Oaxacan heritage and the place where we live, and proud to incorporate these symbols and colors into our logo.